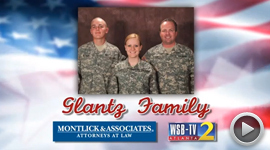 The Glantz family has won a trip to Orlando, Florida from Montlick & Associates! 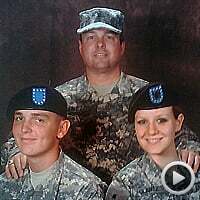 I served 21 years in the Army and both my children are currently serving in the US Military. My son just got back from Afghanistan where he is being submitted for a Purple Heart for injuries he sustained while there. My daughter is also currently serving as a single mother of our 3 year old grandchild and deserves recognition for her service and sacrifices. Then there is my wife. She deserves the most recognition as a military spouse and mom for so long during all the years, deployments, missed holidays, and the like. They say the military spouse is the "hardest job in the military." My family has endured a lot and has given so much of themselves over the past 24 years. I am so proud of them. We are one unit…forged strong over the years to be patriotic, love our country, love all people, and be there when needed and called upon. That's what makes us who we are today! WSB-TV chose the top 5 finalists from entries submitted and then the public voted for the winner on wsbtv.com. Montlick & Associates is happy to provide the Glantz Family with a much-deserved paid vacation to Disney World in Orlando, Florida! 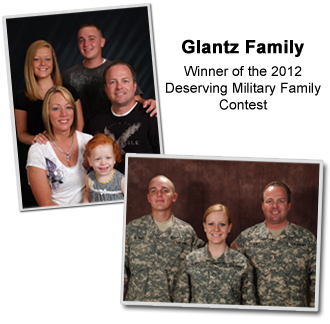 I would like to nominate my family for the most deserving military family. My husband has served time in the military for over 20+ years, through many moves, from overseas to stateside, separations due to TDY, training and field duties; we have continued to keep a strong marriage, which will be 25 years this year, stability for our children. Our children have changed schools 3 times, lost and gained friends, we have moved 3 times in 7 years and will be moving again to yet another duty station this year with hopes of being the final PCS move. 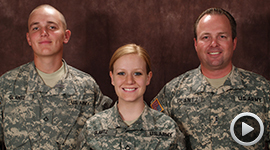 My husband's Brigade left for Afghanistan, Sept 2011 and they are returning home late June, early July 2012. 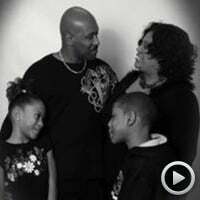 My children and I decided to move from Texas to Atlanta to be with family during their deployment. We have only spent one week together as a family during that time, so there is a much needed vacation time as a family, the last time we had a vacation in Florida was summer 2006. My husband is a decorated soldier who has dedicated his all to serving his country and has spent many countless/sleepless hours, taking care of his military responsibilities, soldiers, as well as his family with no complaints. He is truly a wonderful soldier, son, husband and father. He deserves some real R&R with his family at the most fun place in the world, Walt Disney World. My family would be truly blessed and honored to be chosen to win the Grand Prize trip to Florida as the Most Deserving Military Family. My family endured moving every three years to a new assignment or a new country. My son was born overseas in Holland, and even though it is the Netherlands, he still to this day tells people he was born in “Never Never Land.” That still gets me laughing even as I type this. My family has endured a lot and has given so much of themselves over the past 24 years that I felt that I needed to nominate them just because I am so proud of them. We are one unit… forged strong over the years to be patriotic, love our country, love all people, and be there when needed and called upon. That’s what makes us who we are today! While there are so many deserving military families who should be nominated for this award, I am going to be a little selfish and nominate my own family. My husband, SSGT Ben A. Napier, is a member of RAFB 5th Combat Communication Squadron, and is currently serving his 3rd combat deployment in an undisclosed location in the Middle East. This will be his longest tour, 365 days, away from our family. We have two children, our daughter (Trystan, 8 yrs old and one son (Braden, 13 yrs old). Our son has high functioning autism and considered special needs. We have a specialist that comes into the home 4 days a week to help with him. Ben has recently lost two special people in his life. He lost his grandfather (that he was very close to) this past January, and his younger brother Adam in 2010. I, personally, lost my grandmother last week. While he was on his first tour to Iraq, I returned to college and after four years, I completed the dental hygiene program. With so many schools graduating hygienist every year, I have not been able to find work in this field (Warner Robins, Macon or Perry.) When Ben wasn't deployed, he also worked part time @ Lowes to help compensate for me not working. We are both active with volunteering youth sport and church leagues. I would love to be able to reward him for all of his hard work and dedication to our family by taking a trip to Disney World. This would be a perfect gift for when he comes home next April or sooner for his Rest and Relaxation time. Please help me give our family a vacation from all of the traumatic losses we have shared this year! This family has been a blessing to all in my family and has done so much for people that have sought their help. The father of this family, my Uncle A, has traveled to many places in the world and has always made sure his family stayed together in the protection of his arms. 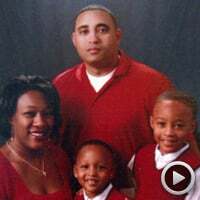 He is a Commander in the U.S. Navy and a husband and father of two beautiful boys. 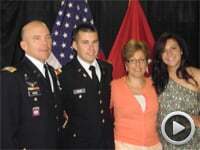 He serves his country with pride and justice while taking care of his loving wife and two sons. Even when across the ocean from their home and family back in the states they still found a way to help their family no matter how far away they were. Even when things were rough and on the edge, they still did not hesitate to be there during the hard times when my family was going through deaths and tears weather it was a conversation on the phone or a video chat on Skype. If it wasn't for them, I would not have made it through school like I am now. Whenever I needed something for school or things to help me in my growing years, they made sure I was taken cared of while still serving their country. They are a blessing to all who are in the family or not. They are a shining example of how the American Family should be. 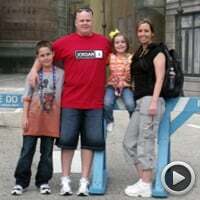 I am writing to nominate my family for the Most Deserving Family for the Orlando trip. My husband has served his country for nearly 30 years in the US Army. He will be retiring in August. He has been a very dedicated infantry officer. He took a battalion to Afghanistan in 2002 and recently went to Iraq for another yr. He has been a very dedicated solider. We will be celebrating 25 years of marriage this July. He has been gone a lot of those 25 years especially as a young officer. He has missed a lot of anniversaries, birthdays, graduation and holidays. Even though he has missed a lot in our lives, he has always managed to be around in emails, skype or phone calls. We have two children that he has been very involved in their lives. They both know that it didn't matter where their dad was, we always knew he was there in spirit. We are very blessed that he has all his body parts and is able to walk and talk, unlike so many other unfortunate soldiers. Our stories are really no different from other families, but what makes us a little different from a few military families is our son was commissioned as a 2Lt in the US Army. His dad gave him his oath on May 10th. My husband wanted to stay active duty until he gave his son the oath. So, in order to stay active he has had to live in Sumter, SC and work at 3rd Army. He comes home on weekends but again he is away during the week. So I nominate my family as my husband ends his 30yr commitment to his country and at the same time my son starts his commitment. Thank you so much.